Over two decades after the death of Notorious B.I.G, his son and Diddy's son have recreated a photo which both men took years ago. 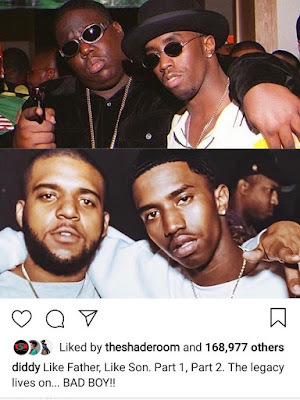 The photo of Biggie Smalls and Diddy was taken shortly before Biggie's death. Recently C.J. Wallace and Christian Casey Combs took a photo in the same pose struck by their fathers years back. Like Father, Like Son. Part 1, Part 2. The legacy lives on... BAD BOY! !